We are all unique, distinct, living beings; yet we are all connected. This profound paradox is almost certain to resonate and make complete sense in your mind after listening to the rising Lowcountry musical group, SondorBlue. Based out of Charleston, South Carolina, the four-piece group originated on Hilton Head Island. It all started in 2011 with a pick-up game of basketball, when Andrew Halley and Connor Hollifield started talking music after the game. Hollifield sent Halley a YouTube video of him performing an original song, and the seed of SondorBlue was firmly planted. Vocalist and multi-instrumentalist John Sheehan joined them a year later and provided the band with speakers for live shows. In 2015, as the shows got larger, Drew Lewis, a longtime friend and Hilton Head Island native, joined them on drums. Today the foursome has acquired a seemingly innate ability to combine their unique vocals and instruments into one universal voice that has many moving parts—yet they are unified in harmony. This talent is not just a natural byproduct of being musicians, but it is one that rises to the level of artistry, which only a minority of musical groups truly achieve. “I think we’re all on the same wavelength and I think that’s a necessity for making good music,” said Halley, the band’s bass player and one of three vocalists. The band’s connectivity of mind, music and spirit goes beyond the sounds they make with their vocal harmonies and instruments; it is also woven into their lives and into their name. Sondor derives from the word sonder, which, like the band, found its way into the world of words in a random but seemingly purposeful and destined way. Urban legend has it that sonder originated with a blogger on Tumblr, a social networking site. It eventually found its way into the Dictionary of Obscure Sorrows (DoOS), which is a web series that defines newly invented words that the site’s writer and editor, John Koenig, believes capture strangely powerful emotions. Similarly, it is clear that, although the guys in SondorBlue are barely in their 20s, they each possess a kind of ageless wisdom that enables them to clearly understand the universal nature and power of music and how it can connect human beings in a way that words alone can’t quite muster. SondorBlue exudes this philosophy in life and in their musical themes. Their lyrics reflect day-to-day life in a real, intentional, thoughtful way. “We all go through a lot of similar problems, but they may just manifest in a different way in your life. And I think that idea is represented in the songs,” Lewis said. Their original songs are rich with three-part harmonies, layered acoustic rhythms, and catchy melodies, reminiscent of Crosby, Stills, Nash and Young, and The Beatles, with a bit of modern artist Ed Sheeran present in the mix. “Each song has a part of me, a part of Andrew, a part of Connor, and a part of Drew in it that is unique to each of us,” Sheehan said. But when you listen to any of their diverse set of songs, there is a definite sense of unity in the vocals and musicianship that creates one voice that is SondorBlue. If there were another word, one that has timeless application that could describe SondorBlue, that word might be universal. The root word, universe, can be translated to mean “turned into one.” And when one describes something as universal, e.g. a universal truth, it is typically intended to mean that the thing described connects with or overlaps many other ideas or meanings so that it can be applicable to all cases. In this spirit, SondorBlue’s sound is not easily categorized; it has a universal nature. Currently the band is deep into their first full-length tour, aptly titled “The Life is Here Tour,” and a new EP, due this summer, to follow their debut four-song 2016 EP, The Realometer. The tour is taking them to cities all over South Carolina, such as Hilton Head Island, Isle of Palms, Charleston, and Columbia, and into other states, including North Carolina, Pennsylvania, and New Jersey. 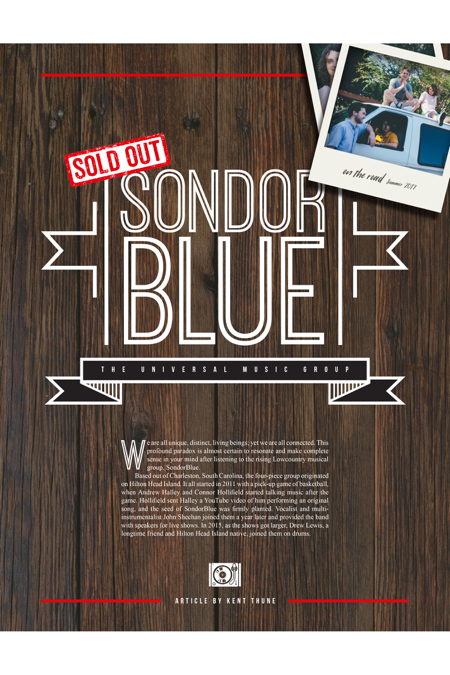 SondorBlue’s live shows bring out the spirit of their music, equally captivating, dreamy and energetic. Their sets have a healthy balance of classic and modern covers, along with their original songs. “We try to keep [the music] all original, but our shows are three hours long. So, we cover bands like Bob Dylan, Oasis, The Beatles, The Police, Alabama Shakes, Coldplay, and U2,” Hollifield said. That’s not a set list that just any band can pull off with success, so it’s no wonder SondorBlue has been attracting crowds at dozens of venues up and down the Eastern Coast of the U.S. 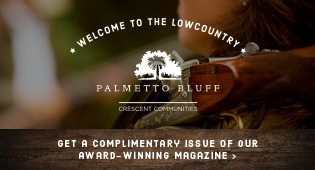 In keeping with the band’s music, spirit and name, the Lowcountry foursome appears to be destined to transform their idea of connectedness into a universal reality—to continue growing together, harmonizing with each other, and connecting with new fans as far as their dreams and touring vehicles can take them. If you happen upon the opportunity to catch a live show this summer, or if you choose to sample their music online, or even purchase their first or their forthcoming sophomore EP, you’ll be part of that connection—the universe, the individual parts turned into one—that defines the music and world of SondorBlue. To make that connection, for anything you want to know or hear about the band, including their music, tour dates, social media sites, and their story, visit them online at sondorblue.com. Kent Thune is a writer, musician, philosopher and money manager (owner of Atlantic Capital Investments, LLC). You can follow his musings on mind, money and mastery of life at TheFinancialPhilosopher.com or on Twitter @ThinkersQuill.